Oceania Cruises offers new Snowbirds in Residence Program for retirees. The Snowbirds in Residence program reconceptualizes the cruise ship as a winter vacation home. Many snowbirds in the U.S. and Canada escape harsh Northeast winters by planning extended vacations, renting properties in warm climates, or buying second homes. The growth of peer-to-peer vacation rental companies (like VRBO.com, Airbnb.com and onefinestay.com) have created new alternatives for snowbirds seeking to escape the cold. Now Oceania Cruises has introduced a new slant on vacation homes for retirees. In January 2017, the cruise line will launch two Caribbean voyages especially crafted for snowbirds, called the Snowbirds in Residence program. Guests can choose from a 58-day itinerary on Oceania Marina departing Miami on January 22 or a 72-day itinerary on Oceania Riviera, also departing from Miami, on January 3. Each of these mid-size ships hold about 1250 passengers (double occupancy) with crews of 800, which makes for easy living and personal service. For more than a decade, there’s been media coverage of long-term cruising as an alternative to nursing home care. A seminal 2004 medical journal article makes the point that cruise ships provide many of the same services and amenities as long-term residential care at a comparable cost. Another journal article suggests that staffing levels and medical care on cruise ships may actually be superior to that typically provided at assisted living facilities. The Oceania Snowbirds in Residence program offers luxury escapes that touch land at a series of beautiful Caribbean ports. How much does it cost for a retiree to escape the cold with pampered service and 24/7 water views? 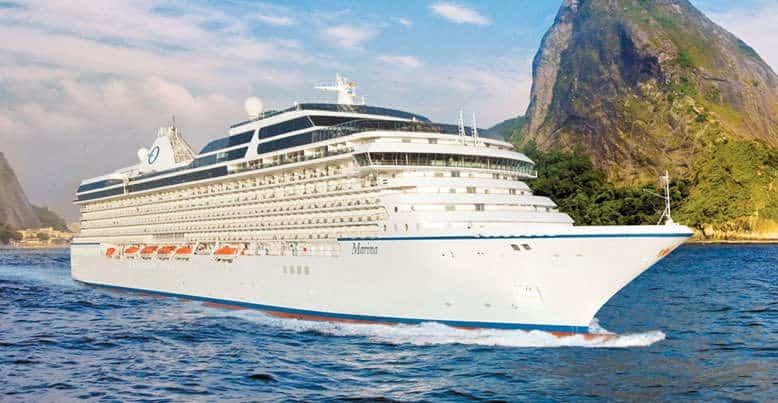 Veranda Stateroom fares start at $15,999 per guest for the Oceania Marina 58-day voyage and $19,999 for the Oceania Rivera 72-day voyage. The cost includes free pre-paid gratuities and a choice of either $4,200 of shipboard credit, 42 free shore excursions or a free beverage package. In addition the line is offering free economy or low-cost first-class airfare from $499 per guest. Pampered Luxury: What Is It Like To Take A Barge Cruise? What a wonderful way to escape and see the world at the same time!